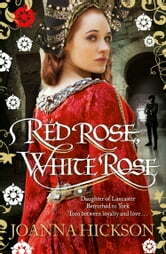 The powerful story of Cecily Neville, torn between both sides in the War of the Roses, from the best-selling author of The Agincourt Bride. In fifteenth century England the Neville family rules the north with an iron fist. Ralph Neville, Earl of Westmorland, a giant of a man and a staunch Lancastrian, cunningly consolidates power by negotiating brilliant marriages for his children. The last betrothal he arranges before he dies is between his youngest daughter, nine-year-old Cicely, and his ward Richard, the thirteen-year-old Duke of York, England’s richest heir.Told through the eyes of Cicely and her half-brother Cuthbert, Red Rose, White Rose is the story of one of the most powerful women in England during one of its most turbulent periods. Born of Lancaster and married to York, the willowy and wayward Cicely treads a hazardous path through love, loss and imprisonment and between the violent factions of Lancaster and York, as the Wars of the Roses tear England’s ruling families apart.